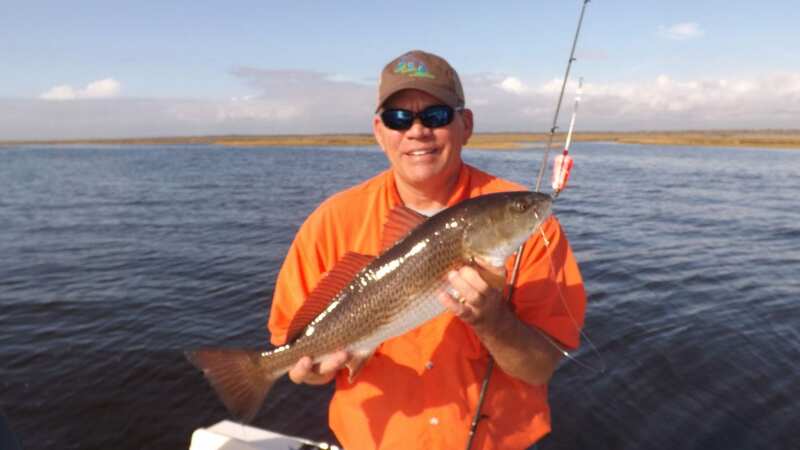 2655 Jim Bruchey of Moultrie, Ga.
Trout fishing is tough in February but if you pick your days of warming trend and fish the optimum tides with better ranges you can catch some nice fish provided the water temps will hold in the sixties. I would recommend Suspending baits exclusively in February. MirrOLure’s Catch 2000’s, Catch Jrs. Catch fives, MirrOdines and the Paul Brown Series in The Devil and both sizes of Soft-Dines will all work now. Choose your baits according to their drop rate and use the lures with the slowest drop in the coldest water. Don’t be too fancy with colors just be sure you have Bone, #11 (white with a red head), something with gold sides , 808 or 750 or #09 in the Soft-Dines and some with Chartreuse as the main attraction. One of those should produce strikes once you find the trout and find the right time of tide. If you are lucky enough to find some mullet in shallow or in a creek work the edges of those schools for larger Sow trout. Darker colors may pay off around mullet. Don’t forsake buying a few dozen shrimp and rig them up under an Original Cajun Thunder or a Back Bay Thunder in February. Fish s-l-o-w and extend your pause between “pops” to 10-15 seconds to allow the trout time to get to your baits. Reds may be more aggressive in February once you locate them and the same suspending baits should be all you need to catch them. Pat McGriff dba One More Cast guide service for 28 years!